We all know the importance of getting a restful night’s sleep. 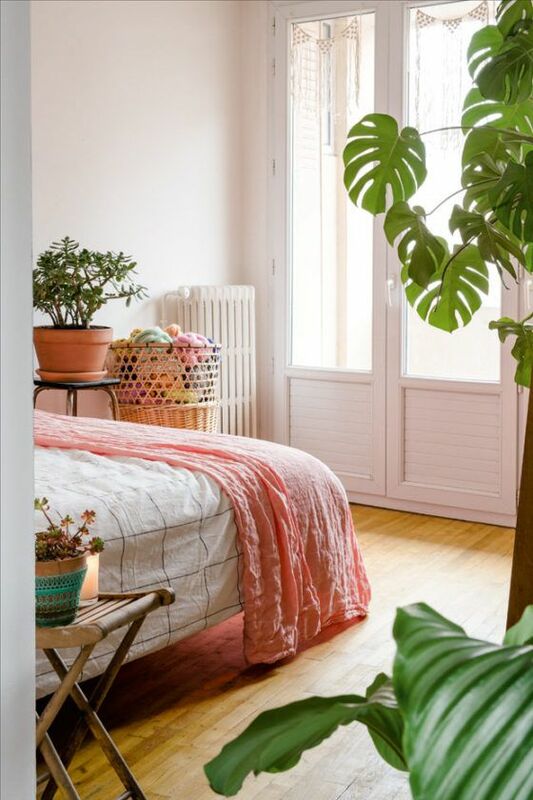 Adding a little Feng Shui to the bedroom will create a sanctuary that you or your partner will want to escape to more often. 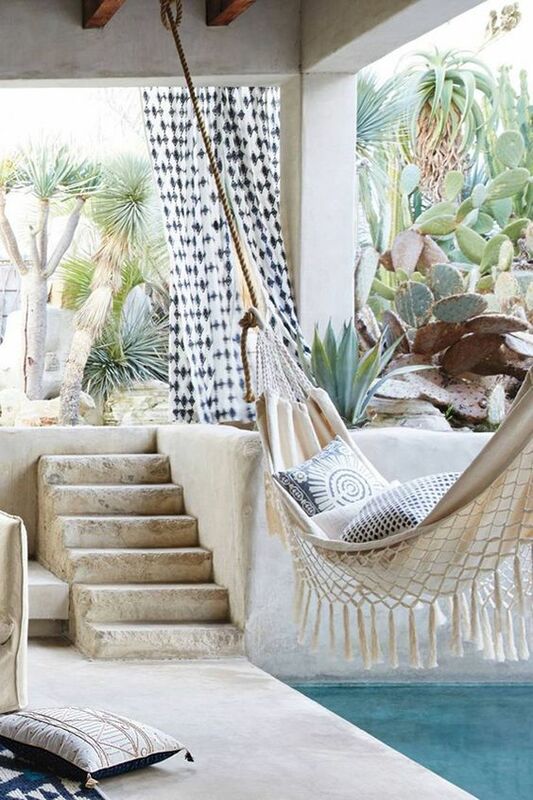 Creating a soothing environment that nurtures you should be at the top of your list this month especially! Using the right types of furniture, fabrics, or artwork will give you a healthy dose of serenity now. 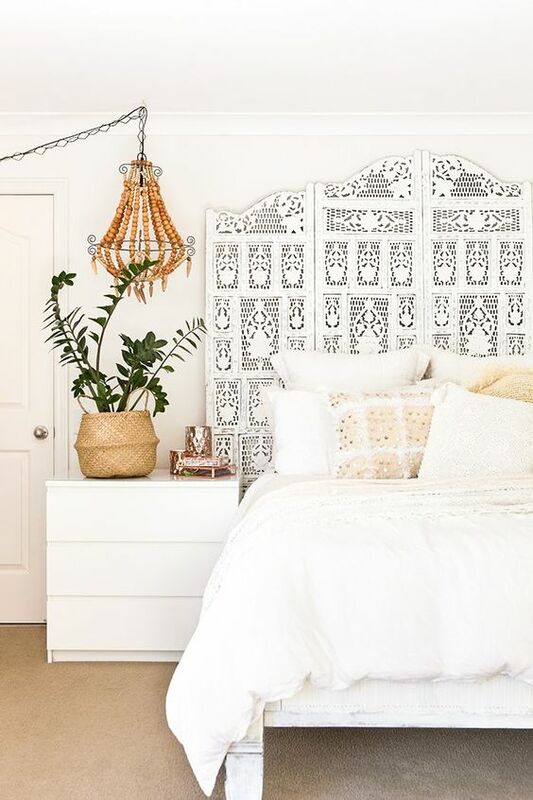 Take a look at some of our favorite bedroom ideas and make a few changes to your space. You will be better able to relax and will wake up more rejuvenated and ready to start your day. 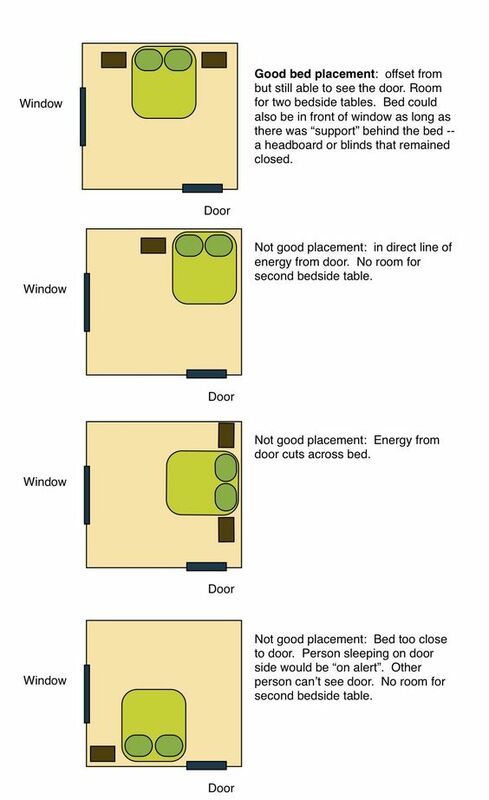 Take a look at our Feng Shui overview article to learn more about how energy works in your home. If the master bedroom is in the Love and Relationships center, add a dash of red or burgundy to inspire passion. (Not sure where that center is? Use the bagua as an easy blueprint for your home or for each room.) Ultimately, the decor here should be warm and inviting. Use soothing colors in a soft palette to keep your bedroom restful. 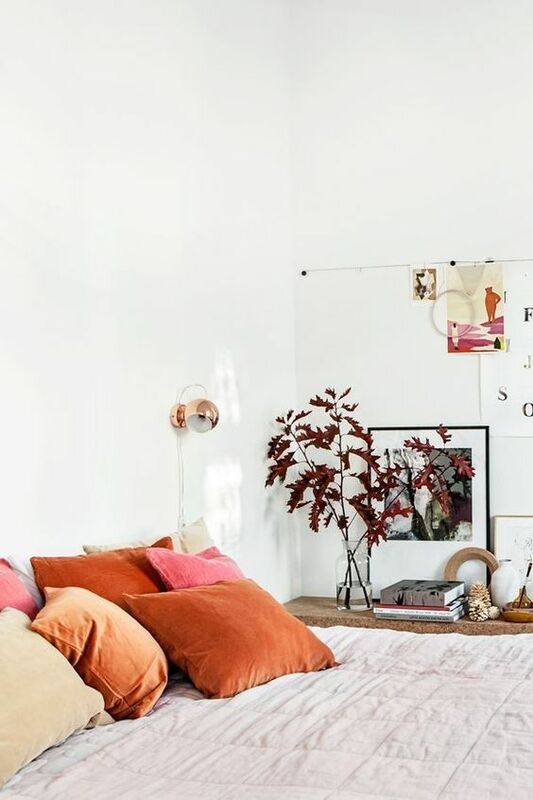 Take a look at Anthropologie’s decorative throw pillows for a cost-effective way to add an extra dose of the right colors. If you like warmer colors, stick to pinks, peaches and earth tones to invite love and romance. Cooler colors are okay too (in lighter shades) as they produce a calming effect. Another thing to watch for is sharp, protruding corners. Furniture with sharp corners, such as end tables, should never be pointing at you while you sleep in your bedroom. Too much energy pointing at you will disrupt your sleep. Additionally, plants are a wonderful way to soften corners and provide extra harmony to your environment. You can place plants in the Wealth center or Relationships center for greater enhancement, but avoid placing plants behind your head. They emit carbon dioxide at night, which is not optimal for respiratory health. We are smitten by the Leya Plant Stand Side Table from Urban Outfitters. The modern shape and cutout details would be a welcome addition in any room! 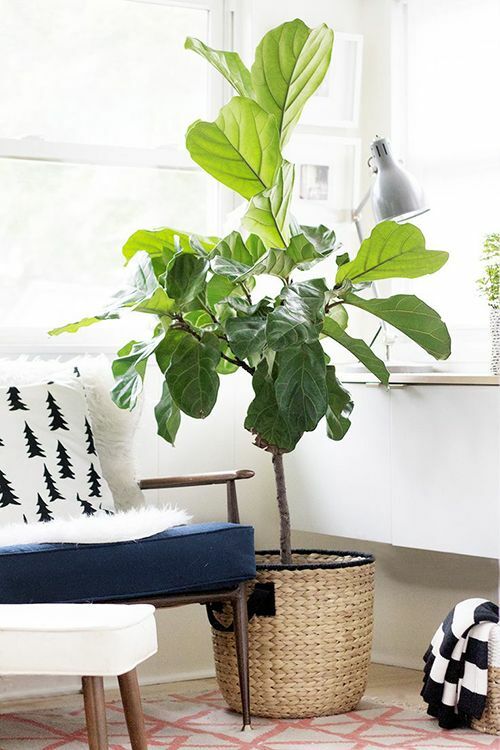 Read our Feng Shui plant article for the best flora and fauna to use indoors. The most important aspect of your bedroom is your bed. A solid headboard and the proper bed placement gives you both strength and security. Headboards should be wood if possible, as the sturdy frame represents stability and support. 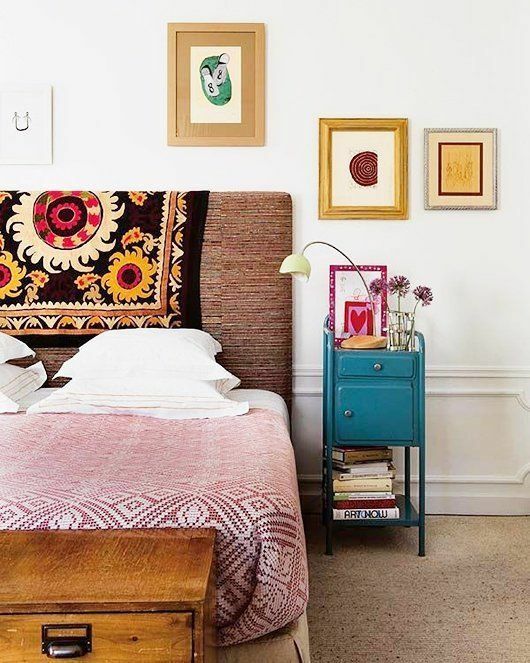 We really like the collection of upholstered headboards at World Market because they are the right combination of soft and sturdy. In addition, your mattress should be changed regularly (every 7 years or so), since it absorbs the energy of past illnesses or relationships. Place your bed in the back corner of the room where you can see the door lying down. If possible, place your bed so with the head pointing east, which brings healing energies associated with the rising of the sun. Take a look at the chart below for more details. For decorating children’s rooms, use bright, cheery colors and prints that inspire imagination. Hygge and West carries super cute wallpaper in fun fruit patterns. 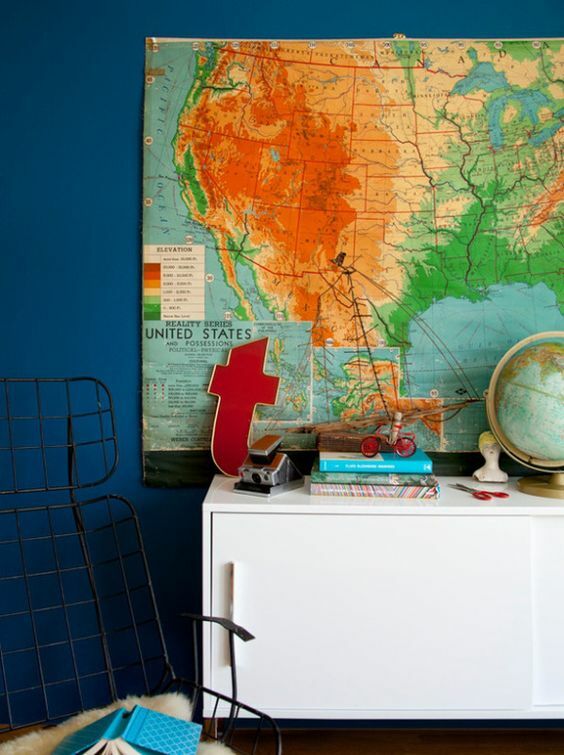 Take a look at our small spaces guide to adding a little wallpaper pizzazz that makes big impact without the eye strain! Most importantly, your child’s bedroom should be free of clutter and well lit. Take down items that hang above your child’s head to increase greater security. If you can, try to keep studying and playing in a different space. This will help them get to sleep faster and rest easier. Our Feng Shui guide for the Children and Creativity center is another good source of inspiration. This is a great place to hang artwork or display accomplishments to give them a sense of pride. The quickest way to kill the romance in a room is by keeping computers, work, or bills there. If you absolutely must keep such items in this space, cover them with a silk scarf when you’re not using them. This dissipates the distraction and unwanted energy drains. Conversely, adding artwork or furniture in pairs to a bedroom is a surefire way to promote companionship. Take a look at our upholstery guide and consider upcycling a vintage set of chairs with a fun fabric. 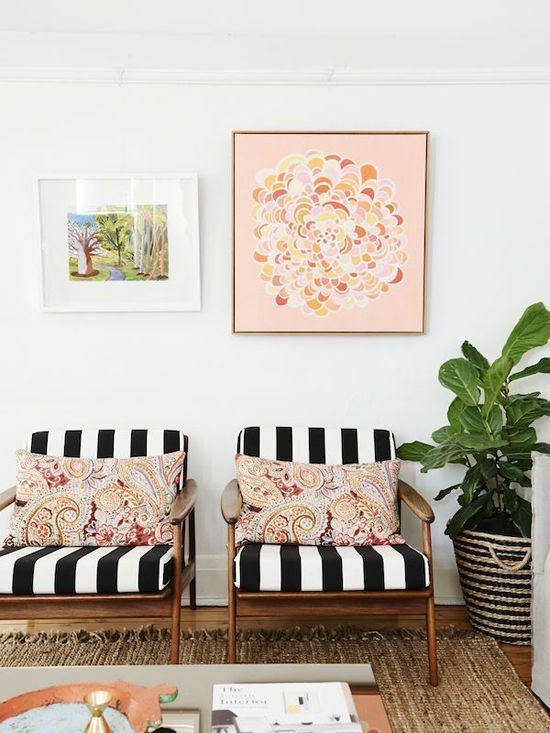 Or, you can take the easy way out and add this pair of Suren-Striped Tillie Chairs from Anthropologie to your space and never look back! Place pictures that remind you of a romantic vacation or special occasion where you can see them easily. Remove photos of your children or parents and place them in a different room. Got to keep the intimacy factor as favorable as possible! Music Alert! 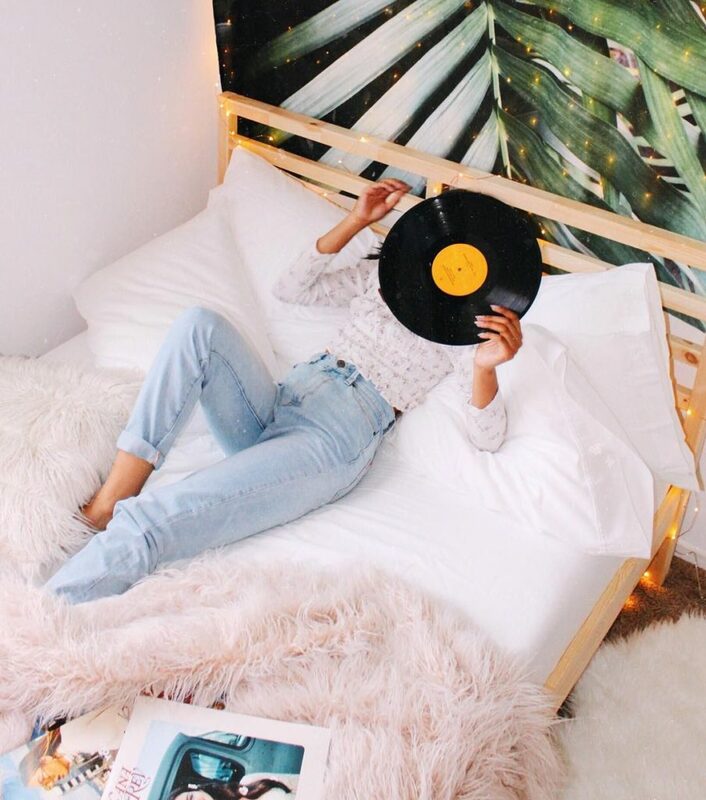 Need some ambiance for your bedroom? Here’s a terrific track from Pan-Pot to create the right mood. Mirrors should be placed in another room if at all possible. They double energy flow and detract from a restful environment. Add candles, soft fabrics, and other items that stimulate the senses to your bedroom. Use fabrics in silk, satin, cotton, flannel, or velvet. Anthropologie is having a sale of an additional 25% off select bedding that you should look at. Their quilts and shams are so soft and luxurious. To die for! Natural fibers work to deliver earth’s energy and calm your senses. This should be an oasis that encourages both romance and communication. Create a refuge from the rest of the house that invites escape often! One of the best habits you can do every morning is make your bed. Making your bed takes only a few minutes, but rewards you with a beautiful bedroom at the end of the day. Pull up the covers and fluff your pillows to start your day off on the right foot! A healthy bedroom full of positive energy will not only take root in your subconscious, it will be a tranquil getaway whenever you need it. Very interesting article! I have a big mirror connected to my dresser. Any suggestions? I like the idea of keeping the room peaceful, but the mirror has to stay. Cover it with a silk scarf! Easy fix for when you’re sleeping. Thanks for reading!